Its all in the details! Modern wedding photography consists of so much more than just the traditional posed portraits of years gone by. Today’s photojournalistic approach to wedding photography dictates that the photographer documents many of the little details that make up the essence of a contemporary bride’s big day.This image is one of my favorite details images and I remember all the details of the wedding where it was created. I arrived at the waterfront condominium overlooking Long Island Sound on the north fork of Long Island out near Orient Point, New York. The bride was still being tended to by her hair stylist and make up artist so I set up this beautiful still life image while she readied herself for her big day. 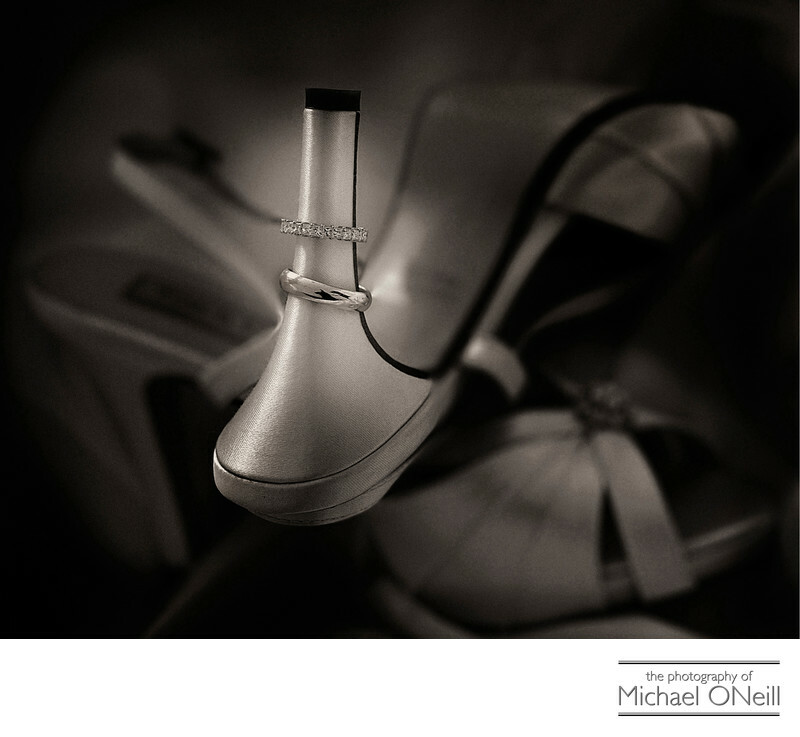 My assistant held a small, compact tungsten light source to illuminate the rings and the heel of the shoe that they were placed upon. After the bride put on her wedding gown we captured a few formal portraits on the deck overlooking the water and then departed for the ceremony and wedding celebration which took place at Macari Vineyards in Mattituck, NY. Back at the studio during the editing, retouching and enhancement process I converted the image to sepia tone for a vintage look.